Posted by Christian Knightly on January 16, 2009, updated September 5, 2014. 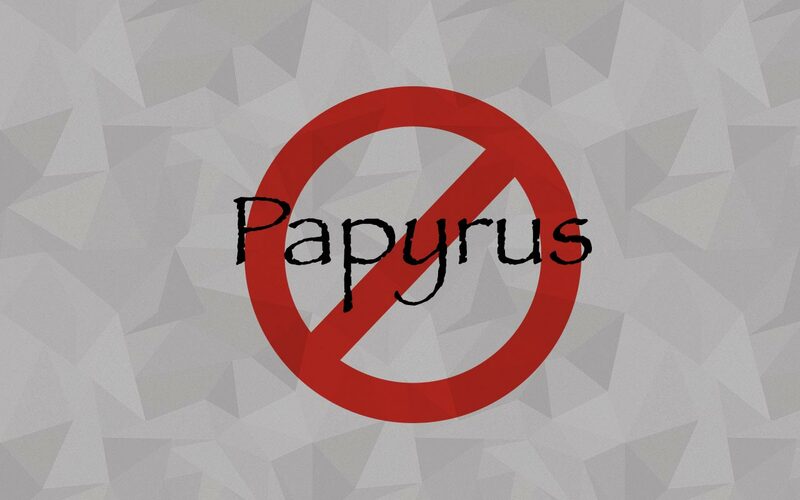 Some of you have asked us why we hate the typeface aptly named Papyrus. Well to be frank, this choice in type is extremely overused by so called ‘designers.’ With all the typeface choices out there, it seems silly to settle on one so blatantly Egyptian. Now, if you are Egyptian or selling an Egyptian product, by all means, use Papyrus, but for those out there that are looking for an organic looking typeface there are hundreds of choices. Below is a list of my favorites. Here’s ITC Cancione. It has a great organic and weathered look and even comes with some pretty cool ornaments, flourishes, alternate glyphs and stylized words which more than makes up for the lack of any lowercase. To purchase this font Click Here. This font is Aquiline. It has a very handwritten look to it, interesting caps and descenders and it’s free! The handwritten script evokes an elegant, classy look. The only downside to this one is that it’s sometimes hard to read. To get this font Click Here. Handserif is a very rustic looking typeface that is easy to read. The rugged and jagged edges of the letters give this typeface a very handmade look. Finally, my favorite, Oxida. Oxida is a beautiful handwritten typeface with tiny jagged marks throughout the design. This typeface is great for a scripty look, but still maintains readability and an organic feel. To obtain this font Click Here. If you find your business falling into any of the above categories, you may find yourself falling victim to the tragedy that is Papyrus. The only (and I do mean ONLY) exception is if your business is somehow Egyptian themed. Otherwise, abuse of Papyrus will leave your logo (and your brand) looking like every other Papyrus-infatuated business out there: same, ordinary, stale. Posted by Christian Knightly on January 16, 2009, updated September 8, 2014.